This is “Data versus Information”, section 15.1 from the book An Introduction to Business (v. 1.0). For details on it (including licensing), click here. Distinguish between data and information. Define information system (IS) and identify the tasks of the information systems manager. By the time the company took the plunge and committed $100 million to marketing-related information technology (IT), Harrah’s had been collecting and storing data about customers for almost a decade. “While the company thought it important to collect customer information,” recalls a senior marketing executive, “the problem was we had millions of customers to collect information on, but we had no systematic way of turning it into a marketing decision. We didn’t know what to do with it.” In other words, Harrah’s was collecting a lot of data but not necessarily any information. So what’s the difference? As an example, suppose that you want to know how you’re doing in a particular course. So far, you’ve taken two 20-question multiple-choice tests. On the first, you got questions 8, 11, and 14 wrong; on the second, you did worse, missing items 7, 15, 16, and 19. The items that you got wrong are merely dataUnprocessed facts.—unprocessed facts. What’s important is your total score. You scored 85 on the first exam and 80 on the second. These two numbers constitute informationData that have been processed or turned into some useful form.—data that have been processed, or turned into some useful form. Knowing the questions that you missed simply supplied you with some data for calculating your scores. Now let’s fast-forward to the end of the semester. At this point, in addition to taking the two tests, you’ve written two papers and taken a final. You got a 90 and 95 on the papers and a 90 on the final. You now have more processed data, but you still want to organize them into more useful information. What you want to know is your average grade for the semester. To get the information you want, you need yet more data—namely, the weight assigned to each graded item. Fortunately, you’ve known from day one that each test counts 20 percent, each paper 10 percent, and the final exam 40 percent. A little math reveals an average grade of 87. Though this is the information you’re interested in, it may be mere data to your instructor, who may want different information: an instructor who intends to scale grades, for example, will want to know the average grade for the entire class. You’re hoping that the class average is low enough to push your average of 87 up from a B+ to an A– (or maybe even an A—it doesn’t hurt to hope for the best). The moral of the story is that what constitutes information at one stage can easily become data at another: or, one person’s information can be another person’s data. As a rule, you want information; data are good only for generating the information. So, how do you convert data into information that’s useful in helping you make decisions and solve problems? That’s the question we’ll explore in the next section. Top managers need information for planning, setting objectives, and making major strategic decisions. Middle managers need information that helps them allocate resources and oversee the activities under their control. First-line managers require information that helps them supervise employees, oversee daily operations, and coordinate activities. 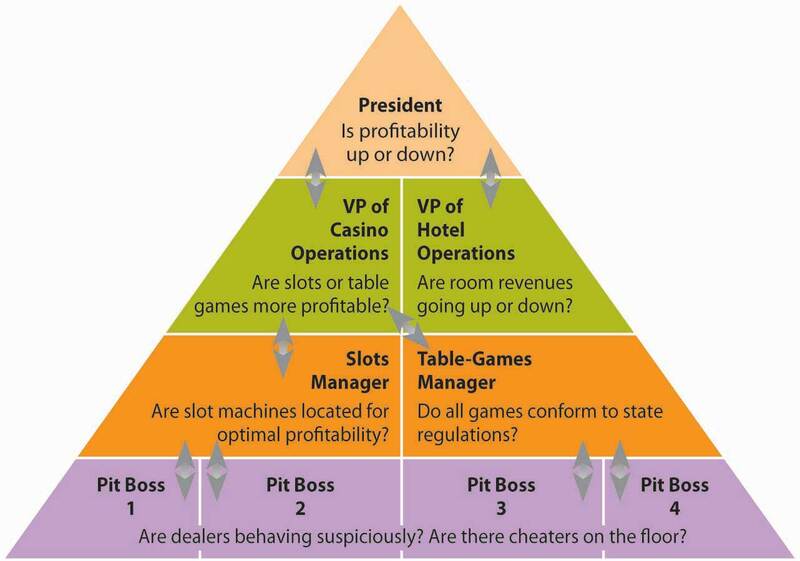 Figure 15.2 "Information Needs and Flows" illustrates a hypothetical hierarchy of information needs at Harrah’s. The president, for example, needs information to determine whether profitability is up or down or if the organization is facing any new competitive threats. At the vice-presidential level, executives need information that will help them in controlling and planning for specific areas of operations. The VP of casino operations, for example, might need to know which operations are most profitable—slots, table games, or other gaming activities. The VP of hotel operations might want to know whether room revenues are going up or down. The information needs of middle-level and lower-level managers are different still. The slot-machine manager might want to know whether the placement of machines on the casino floor affects profitability. The poker manager might want to know whether all table games comply with state regulations. At a lower level, the pit manager (who’s in charge of table games in a particular area) needs to know whether there’s a card-counter at his blackjack table or whether a dealer’s activities are suspicious. Even at a given level, information needs can vary. A manager on the hotel side of the business, for instance, doesn’t care much about profitability at the poker tables, while a pit manager doesn’t have much use for hotel housekeeping reports. The reports that an accountant needs would hardly be the same as those needed by a human resources manager. Having stressed the differences in information needs, we should pause to remind ourselves that the managerial levels, operations, and functions of every organization are intertwined, to a greater or lesser degree. If you’ll glance again at Figure 15.2 "Information Needs and Flows", you’ll be reminded that organizations need to share information, that information must flow, and that it must flow in both directions, bottom-up and top-down. At Harrah’s, for instance, both casino and hotel managers are concerned about security, which is also of interest to managers in different functional areas. Information supplied by the security group is obviously vital to managers in the gaming areas, but HR managers also need it to screen potential employees. Marketing information is clearly important to both casino and hotel operations: to maximize overall profits, the company uses marketing data to fill hotel rooms with customers who spend big in the casinos.Jim Kilby, Jim Fox, and Anthony F. Lucas, Casino Operations and Management, 2nd ed. (Hoboken, NJ: John Wiley & Sons, 2005), 183–84. Harrah’s information needs entail more than allowing individuals in a given casino to share information; information has to be shared among all of Harrah’s thirty-nine casinos. Thus, Harrah’s relies on an integrated IT system that allows real-time communication among all its properties. Installing the system (in the mid-1990s) was complicated, and not everyone in the organization liked the idea. Some managers felt that information sharing threatened their independence. Others, including some in the IT group, doubted that a large number of separate IT systems could be adequately integrated. To get everyone on board, John Bushy, senior VP of information technology, pledged that he wouldn’t cut his hair until the system was up and running. By the time it was operational in 1997, Bushy had hair down to his shoulders, but it was worth it: Harrah’s ability to share real-time information across all its properties has been a major factor in the company’s success. Harrah’s new system has cut costs by $20 million a year, increased brand recognition, and increased the number of customers playing at more than one Harrah property by 72 percent.Meridith LeVinson, “Jackpot! Harrah’s Big Payoff Came from Using IT to Manage Customer Information,” CIO Magazine, February 1, 2001, http://www.cio.com/archive/020101/harrah.html (accessed June 2, 2006). Many large and mid-size companies rely on a highly integrated system called an enterprise resource planning (ERP) systemIntegrated computer system used to channel information to multiple users. to channel information to multiple users. To understand what an ERP system does, forget about the P for planning (it really doesn’t have much to do with planning) and the R for resource (it’s an imprecise term). Focus on the E for enterprise.Christopher Koch, “The ABCs of ERP,” CIO.com, http://www.cio.com/research/erp/edit/erpbasics.html (accessed June 2, 2006). An ERP system integrates the computer needs of all activities across the enterprise into a single system that serves all users. Such broad integration isn’t a simple task, and you wouldn’t be the first person to wonder whether it wouldn’t be easier to give each department its own computer system. Salespeople, for example, need a system that tracks sales and generates sales reports. Meanwhile, manufacturing personnel don’t need to track sales but do need to track inventory. What’s the problem with stand-alone computer systems? Quite simply, users in various departments can’t share information or communicate with each other. What If You Don’t Have ERP? Imagine that you’re a sales manager for a fairly large manufacturing company that produces and sells treadmills. Like every other department in the organization, you have your own computer system. A local sporting-goods store orders one hundred treadmills through a regional sales representative. It’s your job to process the order. It wouldn’t be much of a problem for you to go into your computer and place the order. But how would you know if the treadmills were actually in stock and when they could be delivered? How would you know if the customer’s credit was any good? You could call the warehouse and ask if the treadmills are in stock. If they are, you’d tell the warehouse manager that you’re placing an order and hope that the treadmills are still in stock by the time your order gets there two days later. While you’re at it, you’d better ask for an expected delivery date. As a final precaution, you should probably call the finance department and ask about your customer’s credit rating. So now you’ve done your job, and it can hardly be your fault that because the cost of manufacturing treadmills has gone up, accounting has recommended an immediate price increase that hasn’t shown up in your computer system yet. What If You Do Have ERP? Wouldn’t it be easier if you had an ERP system like the one illustrated in Figure 15.3 "ERP System"—one that lets you access the same information as every other department? Then you could find out if there were one hundred treadmills in stock, the expected delivery date, your customer’s credit rating, and the current selling price—without spending most of the day exchanging phone calls, e-mails, and faxes. You’d be in a better position to decide whether you can give your customer credit, and you could promise delivery (at a correct price) on a specified date. Then, you’d enter the order into the system. The information that you entered would be immediately available to everyone else. The warehouse would know what needs to be shipped, to whom, and when. The accounting department would know that a sale had been made, the dollar amount, and where to send the bill. In short, everyone would have up-to-date information, and no one would have to reinput any data. Data are unprocessed facts. Information is data that have been processed or turned into some useful form. To gather and process data into information and distribute it to people who need it, an organization develops an information system (IS)—the combination of technologies, procedures, and people who collect and distribute the information needed to make decisions and to coordinate and control company-wide activities. In most large organizations, the information system is operated by a senior management team that includes a chief information officer (CIO) who oversees information and telecommunications systems. There may also be a chief technology officer who reports to the CIO and oversees IT planning and implementation. The job is complicated by the fact that information needs vary according to different levels, operational units, and functional areas. In addition, information must be shared. To channel information to multiple users, large and mid-size companies often rely on a highly integrated system called an enterprise resource planning (ERP) system. 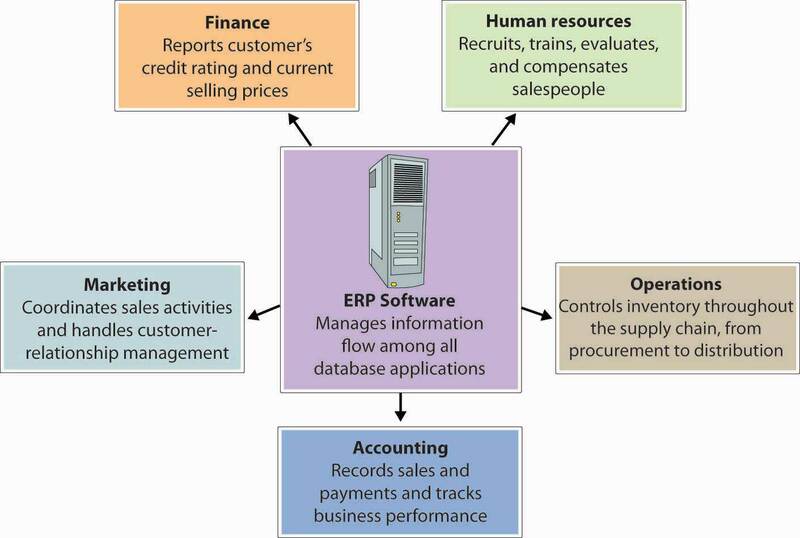 An ERP system integrates the computer needs of all business activities across the enterprise into a single computer system that serves all users. Using the college-application process as an example, explain the difference between data and information. Identify the categories of data that you supplied on your college application and the information generated from them by the admissions department. Consider these three positions at Starbucks: retail store manager (in charge of the day-to-day operations at one store), district manager (responsible for the operations at multiple stores), and president of Starbucks North America (in charge of operations throughout the United States, Canada, and Mexico). Identify the information needs of managers at each level. In what ways could a large automobile dealership, with a service shop and a body shop, benefit from an ERP system?